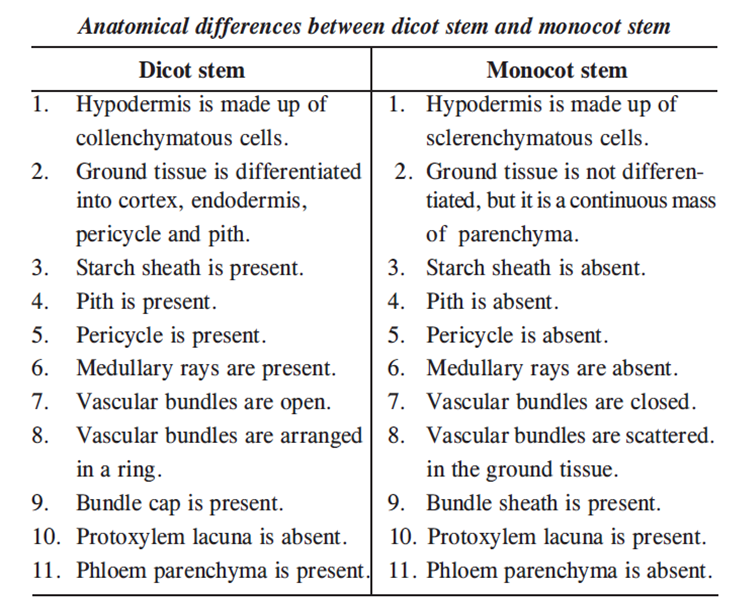 Anatomical differences between dicot and monocot root, stem and leaf must be taught for better understanding. 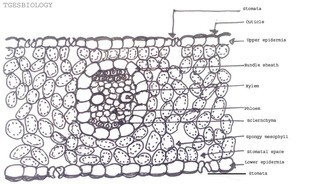 The transverse section of the dicot root shows the following plan of arrangement of tissues from the periphery to the centre. The outermost layer made up o single layer of parenchymatous cells without intercellular spaces.Stomata and cuticle are absent. Root hairs are always single celled. Cortex consists of oval or rounded loosely arranged parenchymatous cells. These cells may store food reserves. It is made up of single layer of barrel shaped parenchymatous cells. The radial and the inner tangential walls of endodermal cells are thickened with suberin. These thickenings are known as casparian strips. But these casparian strips are absent in the endodermal cells (Passage cells) which are located opposite to the protoxylem elements. 4. Stele: All the tissues present inside endodermis comprise the stele. 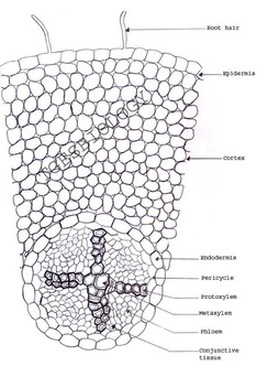 A. Pericycle : Pericycle is generally a single layer of parenchymatous cells found inner to the endodermis. Lateral roots originate from the pericycle. 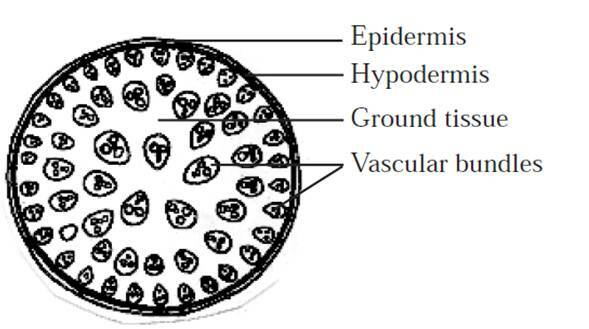 Vascular tissues are in radial arrangement. 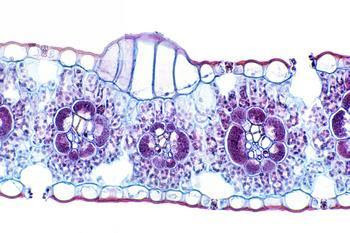 The tissue by which xylem and phloem are separated is called conjunctive tissue. Xylem shoes exarch and tetrarch condition . 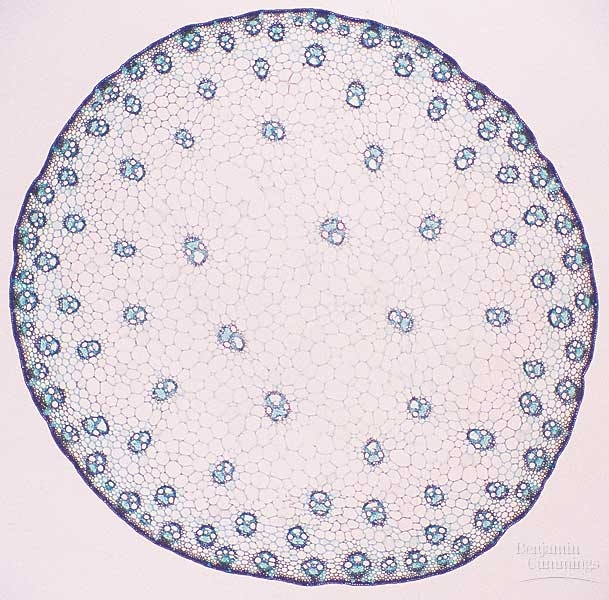 The outermost layer of parenchymatous cells without intercellular spaces.Stomata and cuticle are absent. The cortex is homogenous, consists of oval or rounded loosely arranged parenchymatous cells. The function of cortical cells is storage. A. Pericycle : A single layer of parenchymatous cells found inner to the endodermis. Lateral roots originate from the pericycle. Xylem and phloem are separated by sclerenchymatous conjunctive tissue. Xylem shows exarch and polyarch condition. Metaxylem vessels are generally circular in shape. The central portion is occupied by a large pith consist of thin walled parenchyma cells with intercellular spaces. These cells are filled with abundant starch grains. It is a protective outermost single layer of parenchymatous cells without intercellular spaces. Below the epidermis cortex is differentiated into few layers of collenchyma cells that make hypodermis gives mechanical strength to the stem. A few layers of chlorenchyma cells are present with conspicuous intercellular spaces. . Some resin ducts also occur here. 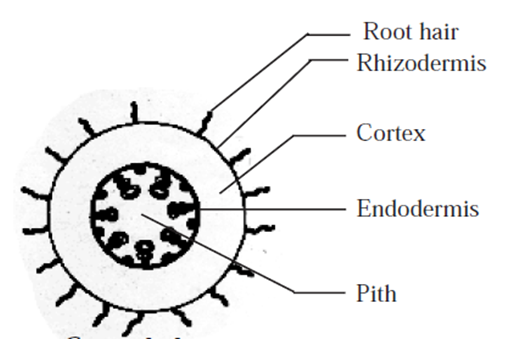 The third zone is made up of parenchyma cells. These cells store food materials. The cells of this layer are barrel shaped arranged compactly without intercellular spaces. Due to abundant starch grains in these cells, this layer is also known as starch sheath. It consists of pericycle, vascular bundles and pith. 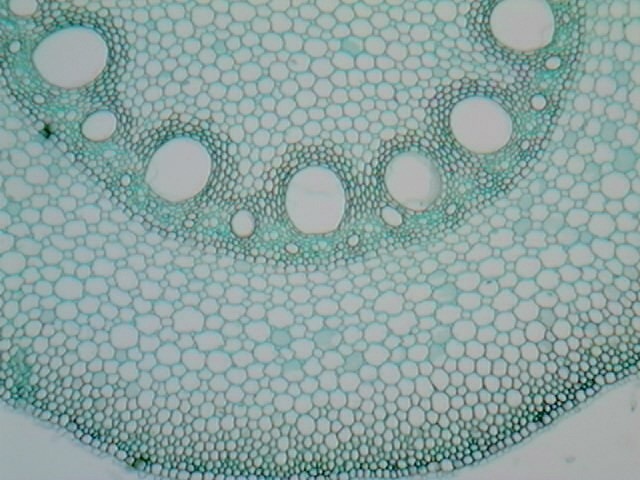 In dicot stem, vascular bundles are arranged in a ring around the pith. Each vascular bundle is conjoint, collateral, open and endarch. The large central portion called pith composed of parenchyma cells with intercellular spaces. The extension of pith between vascular bundles are called as pith ray or medullary rays. Function of the pith is storage of food. It is the outermost layer made up of single layer of tightly packed parenchymatous cells with thick cuticle. There are no epidermal outgrowths. 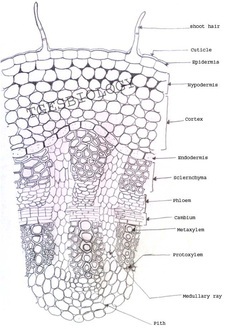 A few layer of sclerenchymatous cells lying below the epidermis constitute the hypodermis, gives mechanical strength to the plant. 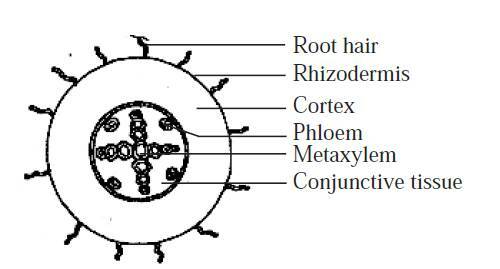 It is not differentiated into cortex, endodermis, pericycle and pith. 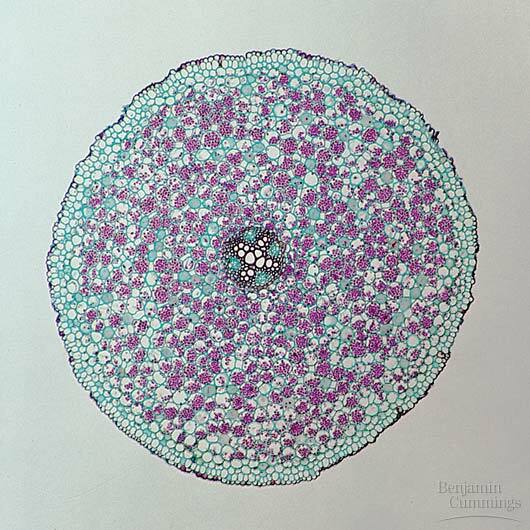 The ground tissue is represented by several layers of loosely arranged parenchyma cells enclosing prominent intercellular spaces. The ground tissue is meant for storage of food. Vascular bundles are scattered in the parenchymatous ground tissue. Vascular bundles are numerous, small and closely arranged in the peripheral portion. Towards the centre, the bundles are comparatively large in size and loosely arranged. 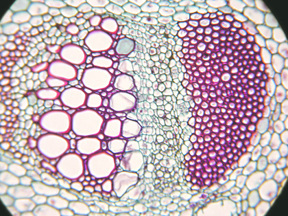 Each vascular bundle is surrounded by a sheath of sclerenchymatous fibres called bundle sheath. The vascular bundles are conjoint, collateral, endarch and closed. 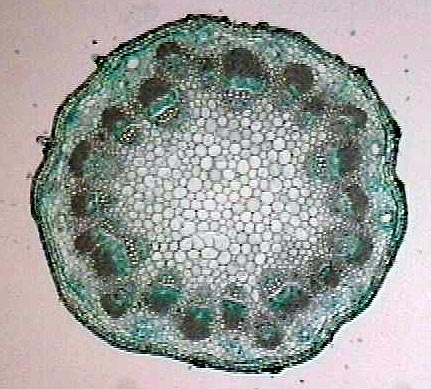 The phloem in the monocot stem consists of sieve tubes and companion cells. Phloem parenchyma and phloem fibres are absent. In a mature bundle, the lowest protoxylem disintegrates and forms a cavity known as protoxylem lacuna. A transverse section through the mid rib region of a typical dorsiventral leaf reveals the following structure. Both upper and lower epidermis are usually made up of a single layer of cells that are closely packed. The cuticle on the upper epidermis is thicker than that of lower epidermis. Stomata are more in number on the lower epidermis than on the upper epidermis. The main function of the epidermis is to give protection to mesophyll. The cuticle helps to check transpiration. Stomata are used for transpiration and gas exchange. The entire tissue between the upper and lower epidermis is called the mesophyll, differentiated into palisade and spongy parenchyma. Below the epidermis, vertically elongated cylindrical cells in one or more layers without intercellular spaces form palisade parenchyma. 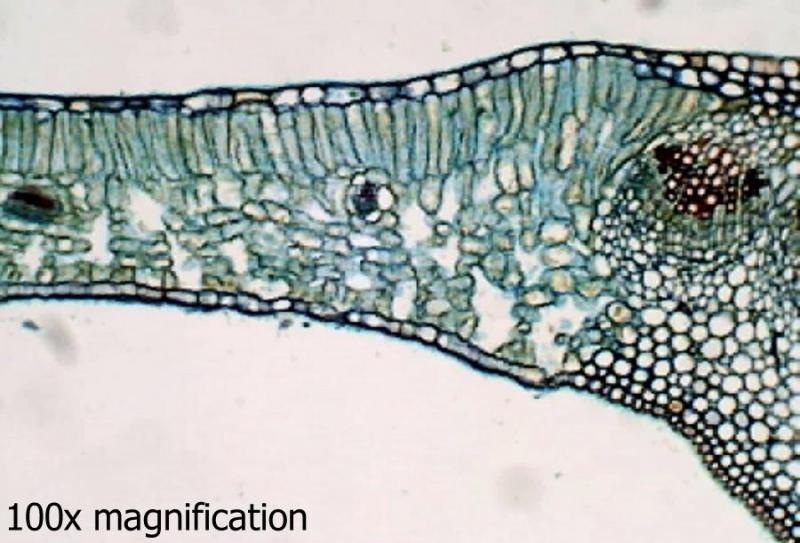 Palisade parenchyma cells contain more chloroplasts than the spongy parenchyma cells. The function of palisade parenchyma is photosynthesis. Below palisade parenchyma towards lower epidermis, irregularly shaped, loosely arranged cells with numerous air spaces form spongy parenchyma. Spongy cells facilitate the exchange of gases with the help of air spaces. Vascular bundles are conjoint, collateral and closed. 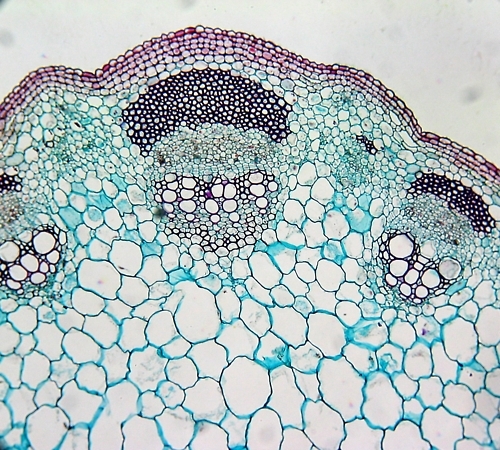 Xylem is present towards the upper epidermis, while the phloem towards the lower epidermis. 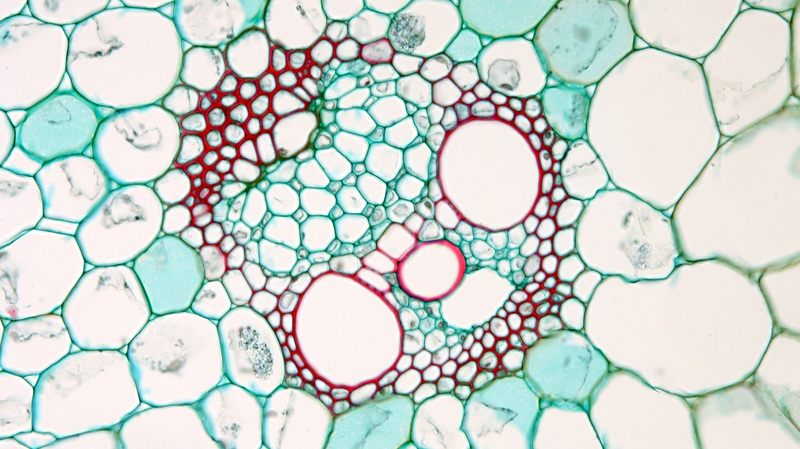 Vascular bundles are surrounded by a compact layer of parenchymatous cells called bundle sheath or border parenchyma. Protoxylem vessels are present towards the upper epidermis. 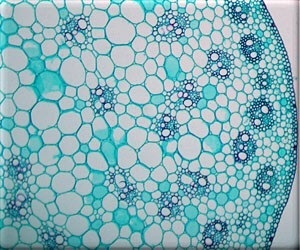 Phloem consists of sieve tubes, companion cells and phloem parenchyma. Phloem fibres are absent. 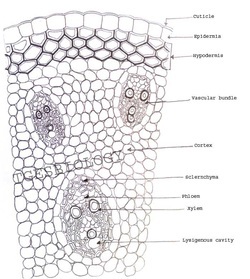 Xylem consists of vessels and xylem parenchyma. Tracheids and xylem fibres are absent. 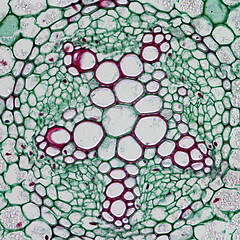 A transverse section passing through the midrib region of an iso-bilateral leaf (Maize) reveals the following structure. Cuticle and trichomes are present in both the layers. 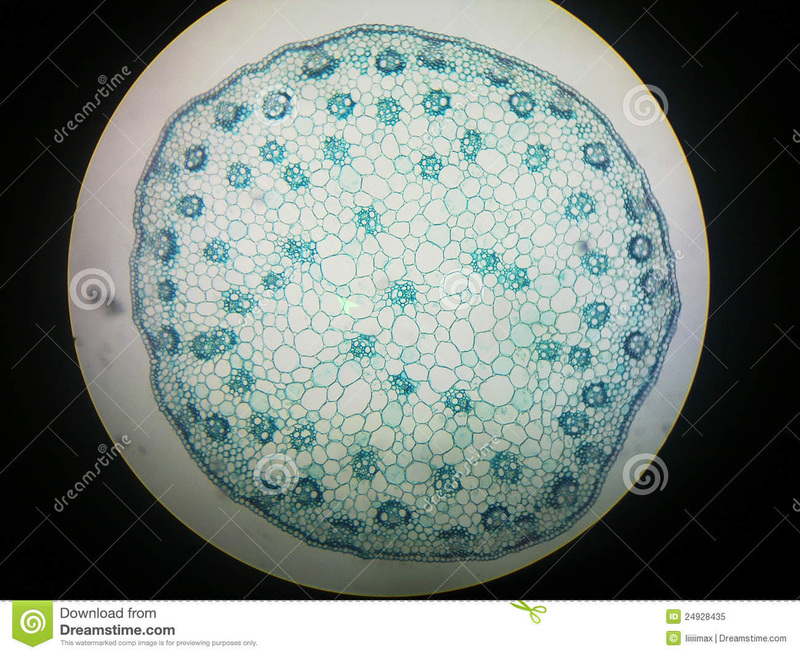 Stomata are equal in number on both layers. This condition is described as amphistomatic. A few cells in the upper epidermis are enlarged to form motor cells called bulliform cells.Helps in rolling and unrolling. It is ground tissue that occurs between the two epidermal layers not differentiated into palisade and spongy parenchyma. 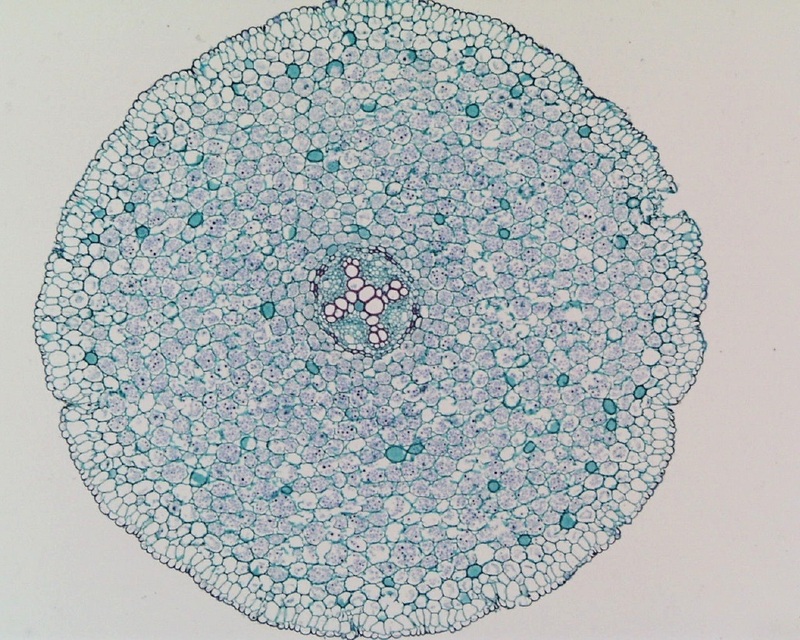 It is composed of many layers of loosely arranged, spherical or oval chlorenchyma cells. Has few intercellular spaces. 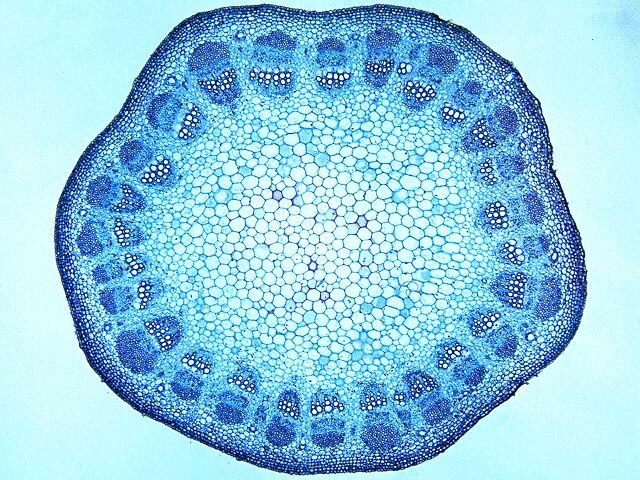 Each vascular bundle is surrounded by a bundle sheath composed of a single layer of compactly arranged cells. 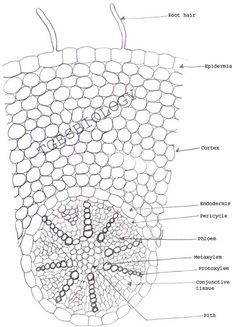 Xylem is found towards upper epidermis and phloem is towards lower epidermis. 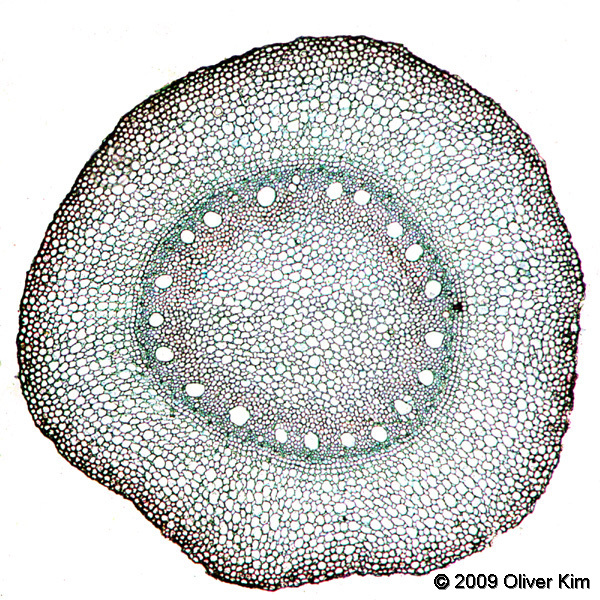 The vascular bundle is described as conjoint and collateral with endarch xylem. 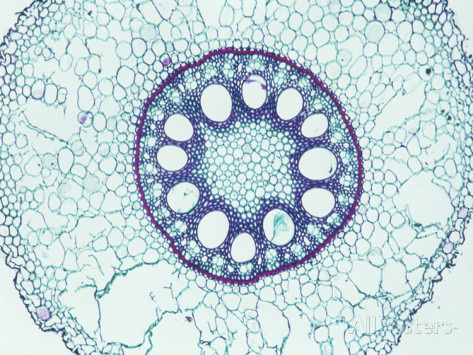 The oldest and the largest vascular bundle is found in the centre. It is known as midrib vein. The bundle sheath of the midrib vein is connected to the upper and lower epidermal layers by sclerenchyma cells representing bundle sheath extensions or hypodermal sclerenchyma.